When my mother escaped from the dangerous life she and her family endured in Russia, the last thing anyone thought of was their wardrobe. 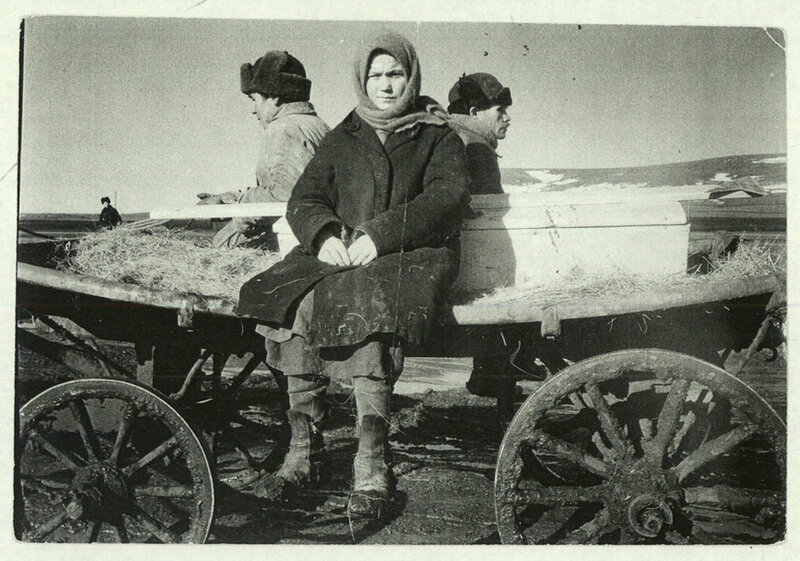 They faced a daunting journey across Russia, Poland and Europe and struggled as they travelled with little other than the clothes they wore. In the early 1900’s her family’s odyssey landed them in Mexico when they could not gain entry to the United States. She attended school in Hermosillo in the state of Sonora, but only through the sixth grade. She always lamented the fact that she was unable to continue her education and was embarrassed by it. But she was innately bright and was actually a bit of a brainiac with numbers. After she and my father married and settled in Los Angeles, my mother began applying her numerical talents to card games. She played bridge, poker, pan and blackjack. She even used to go to the casinos in Bell and the City of Commerce...and she won. A lot. In fact, she told my sisters and me that when she died we should not throw out any container in the kitchen or pantry before checking it for her hidden stash of cash. Later, when she became quite ill, we followed her instructions and lo and behold, there was money in the oatmeal container, money in the matzo package, money wrapped in food in the freezer. There was hardly a hideaway that she hadn’t cleverly adapted for her personal banking. These discoveries gave us a lot of laughs during a very difficult time. But her gaming skills weren’t limited to the casinos. I remember her playing cards in the living room with three of her friends. One was Lillian Hoffman, mother of struggling actor, Dustin Hoffman. Jeanette Burchman was the mother two excellent artists on the rise, and then there was Betty Pink. 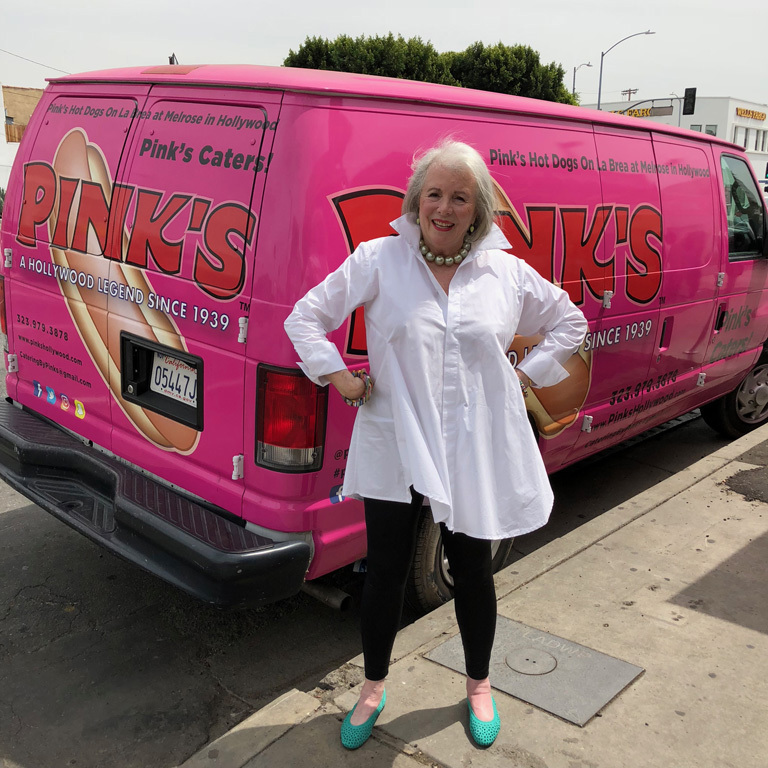 She and her husband started Pink’s Hotdogs in Los Angeles, on Melrose and La Brea back in 1939! Pink’s is open until 2 am and there is always a line of hungry customers, many of them celebrities. 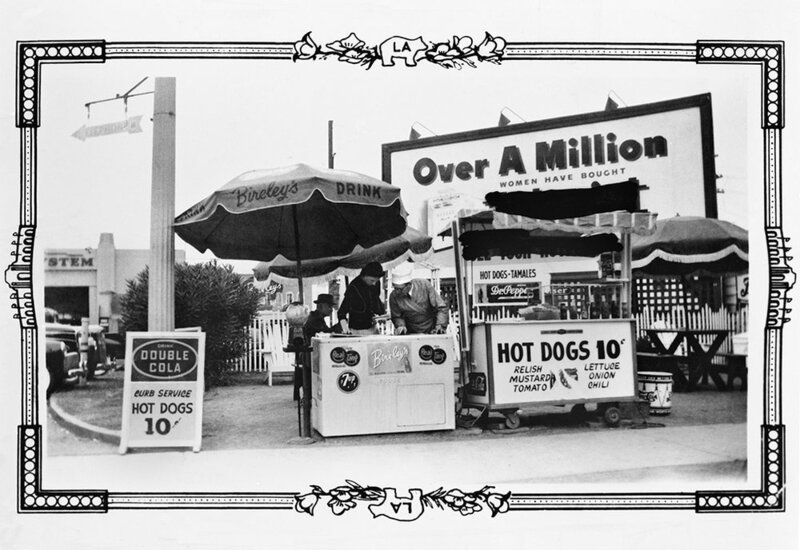 Over the years, some of the hot dogs were named after the greats and near-greats who eagerly await their creations. The menu contains among others, the "Martha Stewart Dog" with mustard, relish, onions, chopped tomatoes, sauerkraut, bacon, and sour cream. Another is the "Rosie O'Donnell Long Island Dog", which is a 10-inch dog topped with mustard, onions, chilli and sauerkraut. 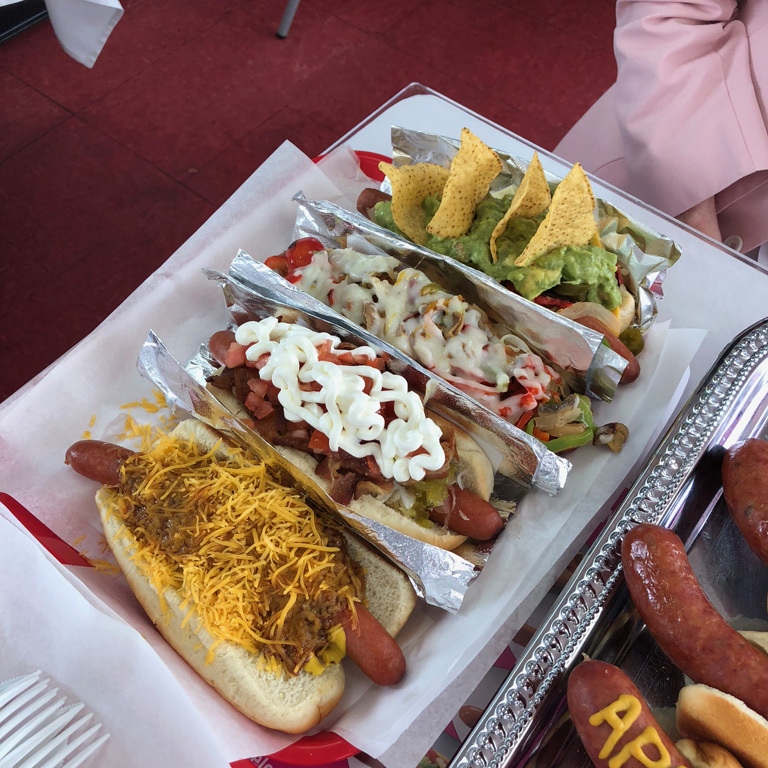 The "Huell Howser Dog" is a standard chilli dog with two of the regular hot dogs on a single bun while the "Ozzy Spicy Dog" named for Ozzy Osbourne features a Polish sausage, nacho cheese, American cheese, grilled onions, guacamole and chopped tomatoes. By way of culinary endorsement, there are also the “Giada De Laurentiis” and “Emeril Lagasse” hot dogs. Even Marlon Brando has his name on a dog! So, why should I do a blog about Pink’s to feature the “Artist’s Smock” by Planet. Well, I’d been admiring this blouse for ages at Artfulhome.com. and although I could have chosen a museum or a garden, to showcase this shirt, my stomach suddenly sent me a message that it was lunchtime. Bingo! Lunch AND fashion. I telephoned Pink’s and mentioned that my mother used to play cards with Betty Pink. 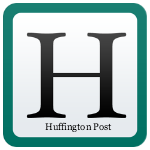 The stand is still run by the family –– daughter, Beverly, son, Richard, and his wife, Gloria. Although Richard didn’t remember my mother, he was very happy to have me come to Pink’s and photograph my “Artist’s Smock shirt”. I didn’t tip my hand, but I really wanted to get behind the counter and cook some famous Pink’s hot dogs. Talk about a bucket list. Richard Pink and his wife, Gloria welcomed us with open arms and an open kitchen. 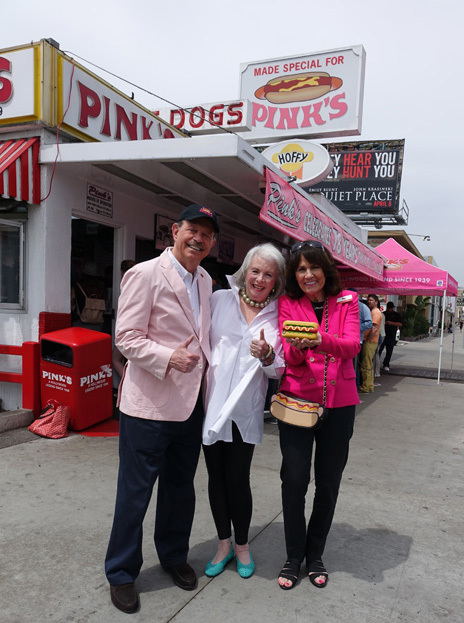 He was wearing a pink blazer and his wife, Gloria was wearing a shocking pink blazer with a hot dog purse and a hot dog iPhone case. 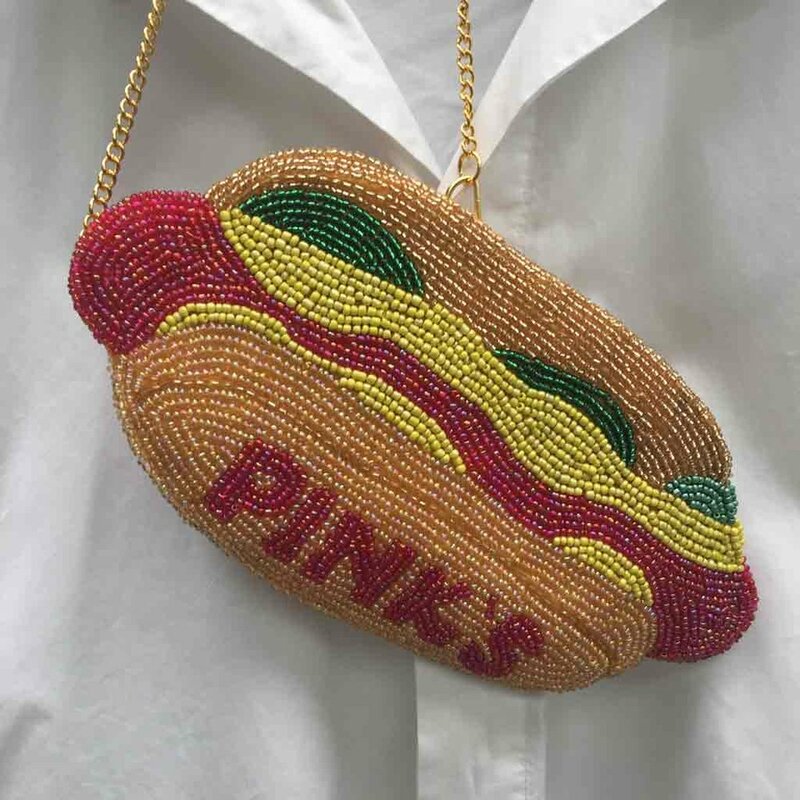 They sell an adorable and wearable beaded Pink’s purse which resonates with a Judith Lieber vibe. They told us stories about many of the celebrities who have eaten at Pink’s over the past 70 years. It seemed that anyone and everyone in showbiz had downed a Pink’s dog. Marlon Brando holds the record for eating the most hot dogs in one sitting: eighteen. Hungry as I might be, I was not going to compete with him. Richard and Gloria asked me what hotdogs I’d like to try. And then brought out a tray with four gorgeous creations. My first try was the Martha Stewart. I figured she would know the best combination. I was a little wary of the ingredients but it was my favorite. Pink’s also has a fascinating website with the history of the stand. Take a look at the variety of hot dogs I had to laugh at some of the creations. My favorite name was the Lord of the Rings. It’s a hot dog inserted into fried onion rings. I wonder if it shouldn’t be rated, “R”? 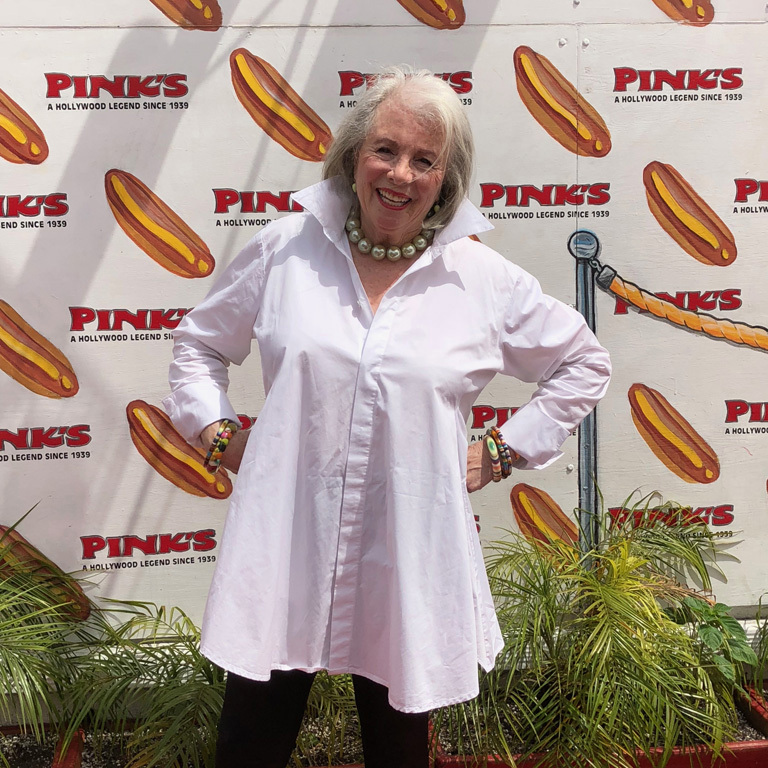 I spent a couple of hours at Pink’s revelling in Richard and Gloria’s hospitality and looking quite smart in my elegant Artist’s smock by Planet from Artfulhome.com . That’s what I love about this great looking white shirt with its crisp, elegant, lines. You can wear it anywhere. 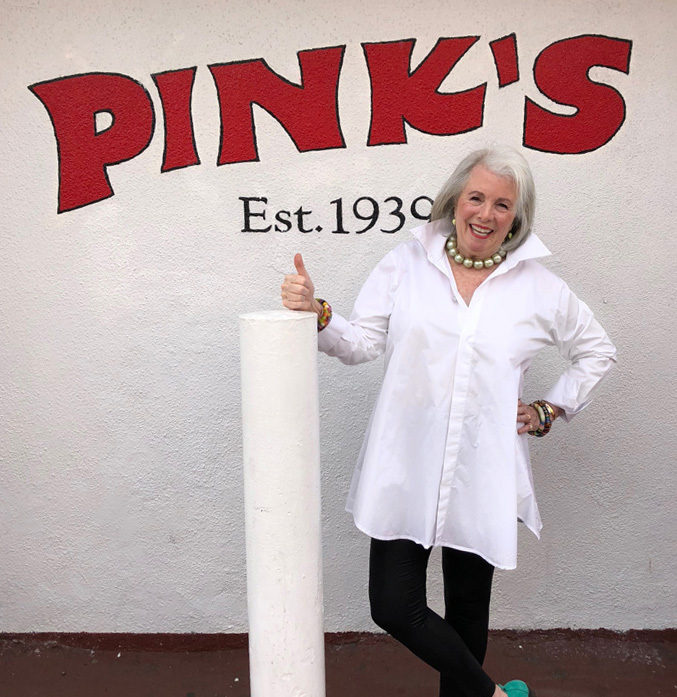 Think Sharon Stone at the Oscars in a white shirt, and then, Sandra Sallin at Pink’s in a white shirt. I can see it with obvious jeans or a pair of my tights that look like tuxedo pants. Then I add a great necklace and I’m ready to party. Want to laugh? 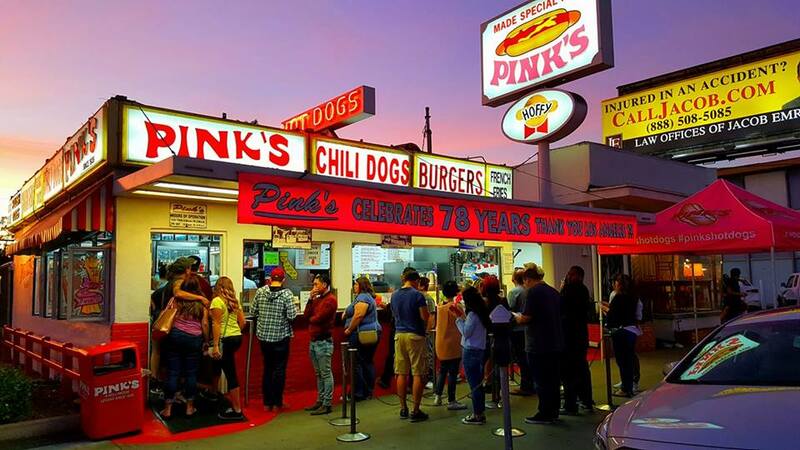 Check out James Corden's video visit to Pinks! It's hilarious. 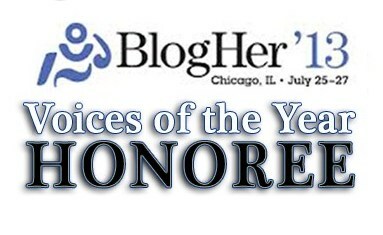 **Ths post was sponsored by the artistic and stylish website artfulhome.com.But the opinions are all my own. Thank you artfulhome.